Apatite is a group of phosphate minerals, usually referring to hydroxylapatite, fluorapatite and chlorapatite, with high concentrations of OH−, F− and Cl− ions, respectively, in the crystal. The formula of the admixture of the three most common endmembers is written as Ca10(PO4)6(OH,F,Cl)2, and the crystal unit cell formulae of the individual minerals are written as Ca10(PO4)6(OH)2, Ca10(PO4)6F2 and Ca10(PO4)6Cl2. 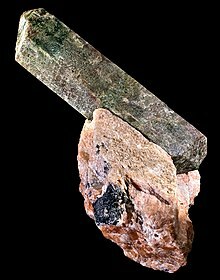 The mineral was named apatite by the German geologist Abraham Gottlob Werner in 1786, although the specific mineral he had described was reclassified as fluorapatite in 1860 by the German mineralogist Karl Friedrich August Rammelsberg. Apatite is often mistaken for other minerals. This tendency is reflected in the mineral's name, which is derived from the Greek word απατείν (apatein), which means to deceive or to be misleading. Apatite is one of a few minerals produced and used by biological micro-environmental systems. Apatite is the defining mineral for 5 on the Mohs scale. Hydroxyapatite, also known as hydroxylapatite, is the major component of tooth enamel and bone mineral. A relatively rare form of apatite in which most of the OH groups are absent and containing many carbonate and acid phosphate substitutions is a large component of bone material. Fluorapatite (or fluoroapatite) is more resistant to acid attack than is hydroxyapatite; in the mid-20th century, it was discovered that communities whose water supply naturally contained fluorine had lower rates of dental caries. Fluoridated water allows exchange in the teeth of fluoride ions for hydroxyl groups in apatite. Similarly, toothpaste typically contains a source of fluoride anions (e.g. sodium fluoride, sodium monofluorophosphate). Too much fluoride results in dental fluorosis and/or skeletal fluorosis. Fission tracks in apatite are commonly used to determine the thermal histories of orogenic (mountain) belts and of sediments in sedimentary basins. (U-Th)/He dating of apatite is also well established from noble gas diffusion studies for use in determining thermal histories and other, less typical applications such as paleo-wildfire dating. Phosphorite is a phosphate-rich sedimentary rock, that contains between 18% and 40% P2O5. The apatite in phosphorite is present as cryptocrystalline masses referred to as collophane. The primary use of apatite is in the manufacture of fertilizer – it is a source of phosphorus. It is occasionally used as a gemstone. Green and blue varieties, in finely divided form, are pigments with excellent covering power. During digestion of apatite with sulfuric acid to make phosphoric acid, hydrogen fluoride is produced as a byproduct from any fluorapatite content. This byproduct is a minor industrial source of hydrofluoric acid. Fluoro-chloro apatite forms the basis of the now obsolete Halophosphor fluorescent tube phosphor system. Dopant elements of manganese and antimony, at less than one mole-percent, in place of the calcium and phosphorus impart the fluorescence, and adjustment of the fluorine-to-chlorine ratio adjusts the shade of white produced. This system has been almost entirely replaced by the Tri-Phosphor system. In the United States, apatite-derived fertilizers are used to supplement the nutrition of many agricultural crops by providing a valuable source of phosphate. Apatites are also a proposed host material for storage of nuclear waste, along with other phosphates. Apatite is infrequently used as a gemstone. Transparent stones of clean color have been faceted, and chatoyant specimens have been cabochon-cut. Chatoyant stones are known as cat's-eye apatite, transparent green stones are known as asparagus stone, and blue stones have been called moroxite. If crystals of rutile have grown in the crystal of apatite, in the right light the cut stone displays a cat's-eye effect. Major sources for gem apatite are Brazil, Burma, and Mexico. Other sources include Canada, Czech Republic, Germany, India, Madagascar, Mozambique, Norway, South Africa, Spain, Sri Lanka, and the United States. Apatite is occasionally found to contain significant amounts of rare-earth elements and can be used as an ore for those metals. This is preferable to traditional rare-earth ores such as monazite, as apatite is not very radioactive and does not pose an environmental hazard in mine tailings. However, apatite often contains uranium and its equally radioactive decay-chain nuclides. Apatite is an ore mineral at the Hoidas Lake rare-earth project. The standard enthalpies of formation in the crystalline state of hydroxyapatite, chlorapatite and a preliminary value for bromapatite, have been determined by reaction-solution calorimetry. Speculations on the existence of a possible fifth member of the calcium apatites family, iodoapatite, have been drawn from energetic considerations. Structural and thermodynamic properties of crystal hexagonal calcium apatites, Ca10(PO4)6(X)2 (X= OH, F, Cl, Br), have been investigated using an all-atom Born-Huggins-Mayer potential by a molecular dynamics technique. The accuracy of the model at room temperature and atmospheric pressure was checked against crystal structural data, with maximum deviations of c. 4% for the haloapatites and 8% for hydroxyapatite. High-pressure simulation runs, in the range 0.5-75 kbar, were performed in order to estimate the isothermal compressibility coefficient of those compounds. The deformation of the compressed solids is always elastically anisotropic, with BrAp exhibiting a markedly different behavior from those displayed by HOAp and ClAp. High-pressure p-V data were fitted to the Parsafar-Mason equation of state with an accuracy better than 1%. The monoclinic solid phases Ca10(PO4)6(X)2 (X= OH, Cl) and the molten hydroxyapatite compound have also been studied by molecular dynamics. Moon rocks collected by astronauts during the Apollo program contain traces of apatite. Re-analysis of these samples in 2010 revealed water trapped in the mineral as hydroxyl, leading to estimates of water on the lunar surface at a rate of at least 64 parts per billion – 100 times greater than previous estimates – and as high as 5 parts per million. If the minimum amount of mineral-locked water was hypothetically converted to liquid, it would cover the Moon's surface in roughly one meter of water. The ectomycorrhizal fungi Suillus granulatus and Paxillus involutus can release elements from apatite. Wikimedia Commons has media related to Apatite. Werner described the mineral in some detail in an article of 1788. ^ "Fluorapatite mineral information and data". mindat.org. Retrieved 30 January 2018. ^ National Institute of Dental and Craniofacial Research. The story of fluoridation; 2008-12-20. ^ Malusà, Marco G.; Fitzgerald, Paul G., eds. (2019). Fission-Track Thermochronology and its Application to Geology. Springer Textbooks in Earth Sciences, Geography and Environment. doi:10.1007/978-3-319-89421-8. ISBN 978-3-319-89419-5. ISSN 2510-1307. ^ Zeitler, P.K. ; Herczeg, A.L. ; McDougall, I.; Honda, M. (October 1987). "U-Th-He dating of apatite: A potential thermochronometer". Geochimica et Cosmochimica Acta. 51 (10): 2865–2868. Bibcode:1987GeCoA..51.2865Z. doi:10.1016/0016-7037(87)90164-5. ISSN 0016-7037. ^ Wolf, R.A.; Farley, K.A. ; Silver, L.T. (November 1996). "Helium diffusion and low-temperature thermochronometry of apatite". Geochimica et Cosmochimica Acta. 60 (21): 4231–4240. Bibcode:1996GeCoA..60.4231W. doi:10.1016/s0016-7037(96)00192-5. ISSN 0016-7037. ^ Warnock, A.C.; Zeitler, P.K. ; Wolf, R.A.; Bergman, S.C. (December 1997). "An evaluation of low-temperature apatite U Th/He thermochronometry". Geochimica et Cosmochimica Acta. 61 (24): 5371–5377. Bibcode:1997GeCoA..61.5371W. doi:10.1016/s0016-7037(97)00302-5. ISSN 0016-7037. ^ Farley, K. A. (2000-02-10). "Helium diffusion from apatite: General behavior as illustrated by Durango fluorapatite". Journal of Geophysical Research: Solid Earth. 105 (B2): 2903–2914. Bibcode:2000JGR...105.2903F. doi:10.1029/1999jb900348. ISSN 0148-0227. ^ Shuster, David L.; Flowers, Rebecca M.; Farley, Kenneth A. (September 2006). "The influence of natural radiation damage on helium diffusion kinetics in apatite". Earth and Planetary Science Letters. 249 (3–4): 148–161. Bibcode:2006E&PSL.249..148S. doi:10.1016/j.epsl.2006.07.028. ISSN 0012-821X. ^ Idleman, Bruce D.; Zeitler, Peter K.; McDannell, Kalin T. (January 2018). "Characterization of helium release from apatite by continuous ramped heating". Chemical Geology. 476: 223–232. Bibcode:2018ChGeo.476..223I. doi:10.1016/j.chemgeo.2017.11.019. ISSN 0009-2541. ^ McDannell, Kalin T.; Zeitler, Peter K.; Janes, Darwin G.; Idleman, Bruce D.; Fayon, Annia K. (February 2018). "Screening apatites for (U-Th)/He thermochronometry via continuous ramped heating: He age components and implications for age dispersion". Geochimica et Cosmochimica Acta. 223: 90–106. Bibcode:2018GeCoA.223...90M. doi:10.1016/j.gca.2017.11.031. ISSN 0016-7037. ^ House, M.A. ; Wernicke, B.P. ; Farley, K.A. ; Dumitru, T.A. (October 1997). "Cenozoic thermal evolution of the central Sierra Nevada, California, from (UTh)/He thermochronometry". Earth and Planetary Science Letters. 151 (3–4): 167–179. doi:10.1016/s0012-821x(97)81846-8. ISSN 0012-821X. ^ Ehlers, Todd A.; Farley, Kenneth A. (January 2003). "Apatite (U–Th)/He thermochronometry: methods and applications to problems in tectonic and surface processes". Earth and Planetary Science Letters. 206 (1–2): 1–14. Bibcode:2003E&PSL.206....1E. doi:10.1016/s0012-821x(02)01069-5. ISSN 0012-821X. ^ Reiners, P. W.; Thomson, S. N.; McPhillips, D.; Donelick, R. A.; Roering, J. J. (2007-10-12). "Wildfire thermochronology and the fate and transport of apatite in hillslope and fluvial environments". Journal of Geophysical Research. 112 (F4): F04001. Bibcode:2007JGRF..112.4001R. doi:10.1029/2007jf000759. ISSN 0148-0227. ^ Villalba, Gara; Ayres, Robert U.; Schroder, Hans (2008). "Accounting for Fluorine: Production, Use, and Loss". Journal of Industrial Ecology. 11: 85–101. doi:10.1162/jiec.2007.1075. ^ Haxel G, Hedrick J, Orris J. 2006. Rare earth elements critical resources for high technology. Reston (VA): United States Geological Survey. USGS Fact Sheet: 087‐02. ^ Proctor, Robert N. (2006-12-01) Puffing on Polonium – New York Times. Nytimes.com. Retrieved on 2011-07-24. ^ Tobacco Smoke | Radiation Protection | US EPA. Epa.gov (2006-06-28). Retrieved on 2011-07-24. ^ Great Western Minerals Group Ltd. | Projects – Hoidas Lake, Saskatchewan. Gwmg.ca (2010-01-27). Retrieved on 2011-07-24. ^ Cruz, F.J.A.L. ; Minas da Piedade, M.E. ; Calado, J.C.G. (2005). "Standard molar enthalpies of formation of hydroxy-, chlor-, and bromapatite". J. Chem. Thermodyn. 37 (10): 1061–1070. doi:10.1016/j.jct.2005.01.010. ^ Parsafar, Gholamabbas and Mason, E.A. (1994) "Universal equation of state for compressed solids," Physical Review B Condensed Matter, 49 (5) : 3049–3060. ^ Cruz, F.J.A.L. ; Canongia Lopes, J.N. ; Calado, J.C.G. ; Minas da Piedade, M.E. (2005). "A Molecular Dynamics Study of the Thermodynamic Properties of Calcium Apatites. 1. Hexagonal Phases". J. Phys. Chem. B. 109 (51): 24473–24479. doi:10.1021/jp054304p. PMID 16375450. ^ Cruz, F.J.A.L. ; Canongia Lopes, J.N. ; Calado, J.C.G. (2006). "Molecular Dynamics Study of the Thermodynamic Properties of Calcium Apatites. 2. Monoclinic Phases". J. Phys. Chem. B. 110 (9): 4387–4392. doi:10.1021/jp055808q. PMID 16509739. ^ Cruz, F.J.A.L. ; Canongia Lopes, J.N. ; Calado, J.C.G. (2006). "Molecular dynamics simulations of molten calcium hydroxyapatite". Fluid Phase Eq. 241 (1–2): 51–58. doi:10.1016/j.fluid.2005.12.021. ^ Smith, J. V.; Anderson, A. T.; Newton, R. C.; Olsen, E. J.; Crewe, A. V.; Isaacson, M. S. (1970). "Petrologic history of the moon inferred from petrography, mineralogy and petrogenesis of Apollo 11 rocks". Geochimica et Cosmochimica Acta. 34, Supplement 1: 897–925. Bibcode:1970GeCAS...1..897S. doi:10.1016/0016-7037(70)90170-5. ^ McCubbina, Francis M.; Steele, Andrew; Haurib, Erik H.; Nekvasilc, Hanna; Yamashitad, Shigeru; Russell J. Hemleya (2010). "Nominally hydrous magmatism on the Moon". Proceedings of the National Academy of Sciences. 107 (25): 11223–11228. Bibcode:2010PNAS..10711223M. doi:10.1073/pnas.1006677107. PMC 2895071. PMID 20547878. ^ Fazekas, Andrew "Moon Has a Hundred Times More Water Than Thought" National Geographic News (June 14, 2010). News.nationalgeographic.com (2010-06-14). Retrieved on 2011-07-24.